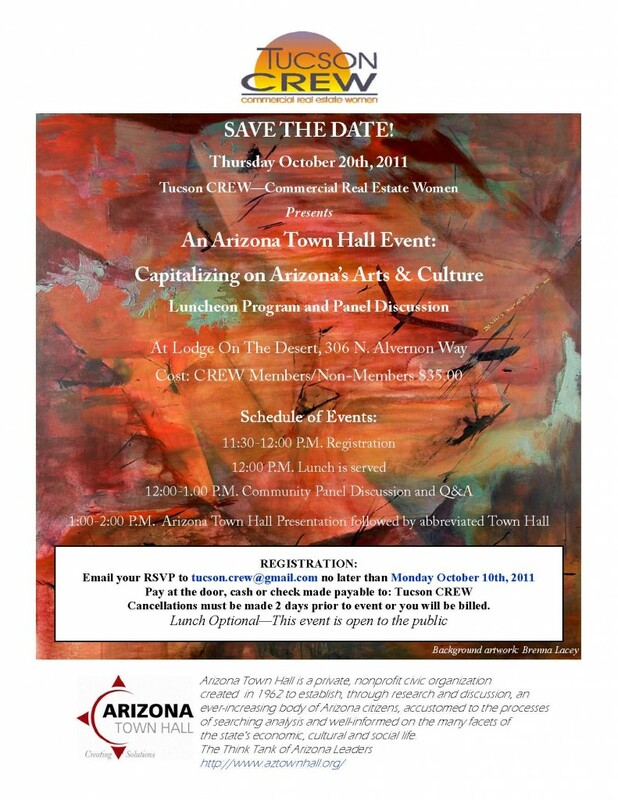 Tucson Commercial Real Estate Women (CREW) has partnered with Arizona Town Hall to present a luncheon program and panel discussion on the impact of arts and culture on our local economy. The event will be held Thursday, October 20, 2011 at Lodge on the Desert. RSVP here. During the networking and registration, Tucson artists of all media will display their artistic talents. Space may still remain for local artists to display their work, particularly those with real estate and economic connections. Contact Judy Susalla at 747-1644 or by email. Program sponsorships are also available — contact Judy Susalla for further information.